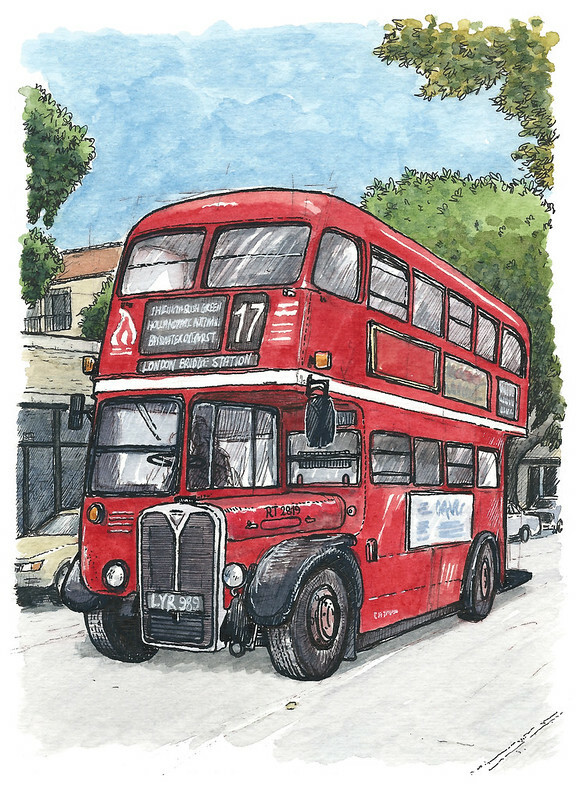 Another London expat* living in Davis, one of the old red double-decker buses imported here back in the 1960s. Oh, they make me feel nostalgic these buses. Of course we don’t have these types any more in London, except on a few touristy routes. I haven’t seen the new Boris bus, though I’m sure it’s as clumsy as its master. Riding on one of these here in Davis though makes me particularly nostalgic for London buses, because the nice modern accessible ones we have now in London don’t bump around quite so much as these cranky old machines. It’s a joyride, let me tell you, and if you have an upset tummy you may want to bring a bag. The funny thing about these buses is that coming from the UK the exit door is not by the pavement/sidewalk, but in the middle of the road – when you get off, the young conductor will stand in the road with a big flag to make sure the cars and cyclists don’t hit you. If only we had such a service in London! Still, the conductors here don’t like it if you walk down the stairs of the bus before the bus comes to a complete halt. I did that, in anticipation of my stop, and was met with a very flustered young conductor convinced I was about to fly off the bus at any moment to a messy and litigious death. I grew up on these sorts of buses and could happily swing down the stairs and leap into the street à la Charing Cross Road, but I know that folk over here are much more cautious about stairs on moving transport so I understand their worry. When I was an open-top bus tour guide on the streets of London a decade ago we too asked people not to walk down stairs (or jump from the bus) while it was moving or not at a stop, not only for our insurance but also because many Americans just aren’t used to it (the insurance was the main reason though). I remember being surprised at how many American and other tourists had never set foot on a double-decker before, and were not sure even how to get upstairs, even assuming these buses had lifts. On once occasion I cheekily joked that the luggage space beneath the stairs was the elevator, until one man actually took me seriously and tried to get inside and asked where the button was. That actually happened. Oh, the giggles we had in the pub afterwards. This bus says it goes to London Bridge Station, but really it just goes to and from UC Davis. Another bus states its destination as Golders Green Station, which always makes me smile. I wonder to myself what people here imagine Golders Green to be like (it’s quite nice actually, could be worse). Another bus is the ‘142’, which was a bus I used to catch to Edgware School from Burnt Oak Broadway whenever I felt the need to make an unnecessarily rowdy bus journey; I usually preferred walking, it took longer but was much less psychologically damaging. I drew this in micron pen and watercolour; obviously I didn’t draw the bus while it was moving, I am not that quick, so I drew it from a previous sketch and some reference shots I’d taken. The background (what there is of it) was done on location on E Street (while a man stood staring warily at me from across the street, obviosuly convinced I was drawing him from great distance, hiding behind a bus). It is partly an urban sketch then.